2012 Brammo Empulse RR Race Bike. Picture credits - Brammo. Submit more pictures. The 2012 Empulse has a 6 speed transmission as standard equipment. The Integrated Electric Transmission (IET�) - IET� is a mechatronic propulsion unit that emulates the feeling and performance of a traditional internal combustion engine, with a specially developed electric motor, clutch and gear shift, that enables the 2012 Empulse to accelerate hard from the line up to a high top speed, something that is just not possible to achieve with a single ratio electric motorcycle. Rear suspension: Box-section style swingarm. Works Performance shocks. Ask questions Join the 12 Brammo Empulse RR Race Bike discussion group or the general Brammo discussion group. 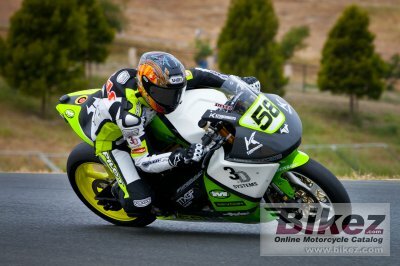 Click here to sell a used 2012 Brammo Empulse RR Race Bike or advertise any other MC for sale. You can list all available Brammo Empulse RR Race Bike bikes and also sign up for e-mail notification when such motorcycles are advertised in the future. Ads with or without pictures are easy to create. Our classifieds are completely free with sections for every country in the world. You can also check out our list of related motorbikes. Compare technical data. Look at photos. View your fellow riders' rating of the bike's reliability, design, engine performance, accident risk, repair cost, etc.